Great coaching is not an accident. Coaching has the power to change the world. The success of almost any revolutionary goal relies on an inside-out approach, and a coach is a powerful facilitator of growth and transformation. But coaching is underestimated. It's seen as an ad hoc tactic rather than a distinctive skill set that gets powerful results. That power springs from the coach’s ability to facilitate significant shifts in thinking and behavior. Coaches who improvise and hope for the best instead of focusing on signature elements and intentional outcomes are only making it harder for themselves and their clients to get the best out of the coaching process. If all you want is to do a little coaching now and then, you might be able to get by for a while by winging it. But if you want to do your life work, tap into your unique genius, and change lives and make a real difference, then taking a signature approach is the better choice. 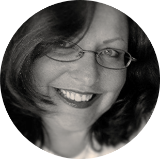 Because switching to a signature coaching focus empowers your clients to purposefully shift their thinking and behavior, and that kind of shift is world-changing. Great clients, great coaching and great success -- all by design. Your signature focus begins with your GENIUS -- the particular gifts that you were born with. I'll help you design a signature coaching business around your genius by coaching you through a series of exercises designed to shine a bright light on what makes you uniquely effective, and show you how to develop your signature methodology into a cohesive brand that makes you stand out and shine. 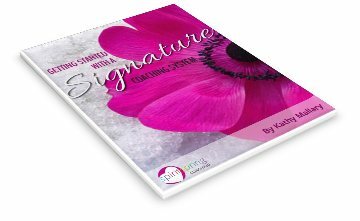 You get better client results and grow a healthier business when you master your unique coaching signature. It's my mission to help you make a difference with as many people as possible -- gracefully, masterfully and profitably. 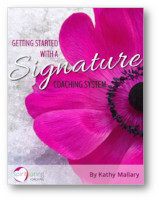 "Together, let's unlock the signature value of your coaching."